The story of the last known Tasmanian tiger, also called a Thylacine, is not a happy one, as a zoo left the animal outside, exposed, to die on a cold night. The creature was native not only to the isolated island country after which it takes its famed designation, but to Australia and New Guinea, or at least it was in the distant past. For long periods, the Thylacine was considered to be one of the largest known carnivorous marsupials, a family that includes the quolls, dunnarts, and the numbat. As it went extinct, the title of being the biggest-known representative of the family went to the Tasmanian devil, currently another threatened species. The Tasmanian tiger was emblematic for the stripes it had on its back, both males and females; its scientific name in Greek translates to “dog-headed pouched one,” largely because of the resemblance to the canine, and the presence of a pouch in both the sexes. On the blue Monday of September 7, 1936, the world sadly lost the last member of this animal species. Named Benjamin, the Thylacine had previously spent three years in captivity at Tasmania’s Hobart Zoo. 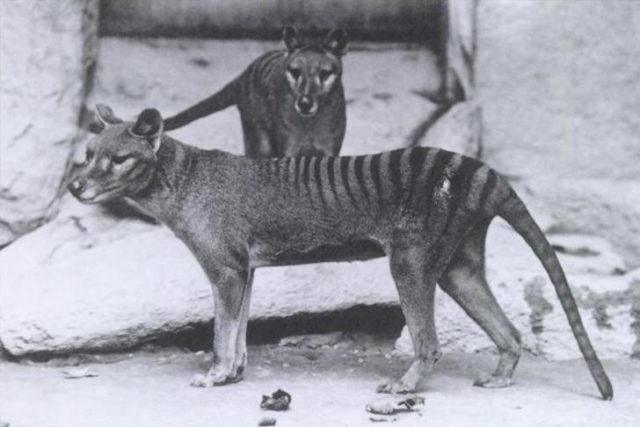 Since then, numerous reports of sighting of a Tasmanian Tiger elsewhere in the Land Down Under followed; so many that the Thylacine is now associated with being an extinct animal that has the most number of post-extinction reports of sightings. Pair of Thylacines: a male and female, received from Dr. Goding in 1902. None of these have been backed by evidence, but one of the most recent alleged sightings took place in March 2017, when scientists made a search in the northernmost parts of Australia’s Queensland. As it appears, the-last-of-its-kind had his name, Benjamin, chosen post-mortem, and thanks to a man called Frank Darby. Claiming to have been an employee at the Hobart Zoo, Darby supposedly used the name Benjamin for the animal in a news story that was published in 1968. 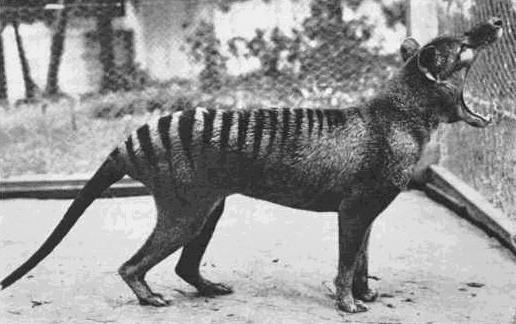 The story caused a slight controversy as no official accounts have been found to confirm that the last Thylacine was ever called Benjamin. Also, zoo officials disputed claims that any Frank Darby used to be an employee at the Hobart. The name, however, persisted. Benjamin had become important after its death. A heated debate followed for years afterward over whether its gender was male or female. Old black and white film footage from 1933, attributed to David Fleay, supposedly shows the last Thylacine months before dying. First, the animal appears to be sitting, then walking in circles within the boundaries of its big cage at the zoo, and somewhere at the end of the video, it appears to be eating a piece of meat. The footage had eventually served as an argument to back up claims that Benjamin was male, but the question remained a subject of debate. It is largely believed that Benjamin died from neglect, as the animal could not endure the severity of the Tasmanian weather at the zoo, far from its natural habitat and way of life. In Tasmania, the daily temperatures may reach great heights, but it can get extraordinarily cold during the night. The Tasmanian tiger would rather function at dawn or dusk, while during other periods of the day it would seek shelter elsewhere in the forests, in a hidden crevice among rocks or perhaps a hollow tree. Benjamin was reportedly locked out of his shelter. The last known thylacine photographed at Beaumaris Zoo in 1933. 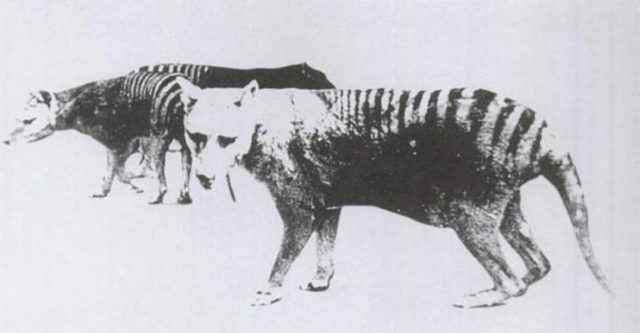 If one looks for more stories about Tasmanian tigers, there aren’t too many good ones. Myths and bad rumors became associated with the creature, and by the beginning of the 20th century everyone thought that the Thylacine was a bloodthirsty animal, and thus it was mistakenly portrayed as a sort of vampire dog. Such information because of the insufficient amount of accurate knowledge about Thylacines. Because of that, the animal sadly became the subject of ill-treatment among shepherds or hunters. A vast majority of them believed the Thylacine would kill their livestock. 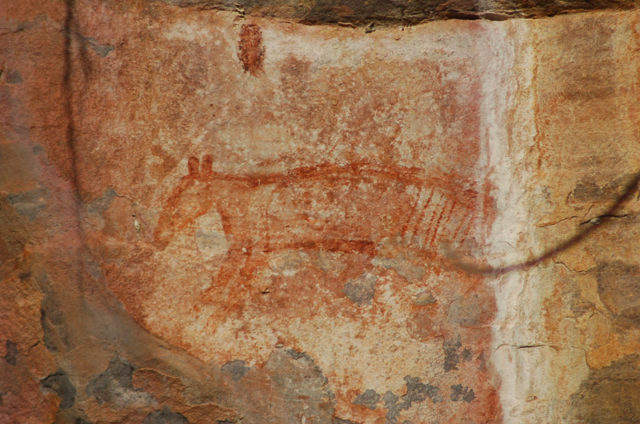 Several other reasons contributed to the Thylacine’s rapid population decline. The ever-growing number of new-comers and settlers in the region seriously jeopardized the natural habitat of this animal, as well as exposing them to diseases they were not immune to. Six decades after the death of Benjamin, Australia launched an annual date of commemoration on September 7, 1966, to mark the National Threatened Species Day. Perhaps the good news in the story of the Thylacine comes in 2008, when researchers and scientists reported on being able to take samples of genetic material from the species. The material was retrieved from a century-old specimen that had been preserved in ethanol. Through experimenting and making use of transgenesis, scientists have reportedly introduced the genetic material into mice. Therefore, there is the slight chance that we might just be able to bring the Thylacine back to life. But then again, maybe that’s only wishful thinking.